Earlier this month, I travelled to China, South Korea and Japan. Speaking at multiple corporate events on innovation and human behaviour, I met leaders from across the world working on some of the most advanced AI, machine learning and innovative technologies to transform their services to even greater levels. However, with the new era of ground-breaking technological advancement comes the sombre hidden reality. The most critical need for big businesses today is to make people-centricity its primary focus. Here are 3 reasons why. Organizational Change Cannot Succeed Without Active Employee Involvement. 75% of change management initiatives fail, per a study by Towers Watson. Almost 60% of joint ventures fail outright, according to a study by Mckinsey. I’ve worked closely with top organizations undergoing change and transformation and one of the biggest black-holes of change management is this. Change is genuinely addressed almost only within top leadership. Majority of the workforce; the mid-level management, associates, agents and specialists don’t get the tools to embrace change. 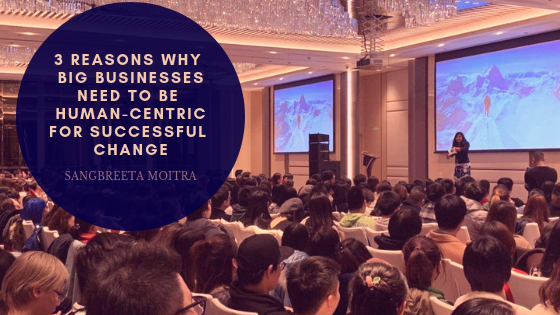 Named among top 10 European keynote speakers of 2019, Sangbreeta Moitra is an award-winning speaker and global strategist on a mission to transform the future of work. Mind-hacking human behaviour, rewiring the innovative brain, transforming our peak performance and creating phenomenal customer relationships, she is passionate about our future being human first, in a time when technology is taking over human work and human connections in ways we cannot imagine.